Yes, the "Superwoman Syndrome" is real. Join us for the spring 2018 meeting of The SheFirst Project Articles Club to find out just how real it is and how it may be impacting your quality of life. We will discuss the following articles: Get The Gloss article Do You Have Superwoman Syndrome?, archived New York Times article 'Enough is Enough' for Ex-Superwoman, and New York Times article The Strong and Stressed Black Woman. 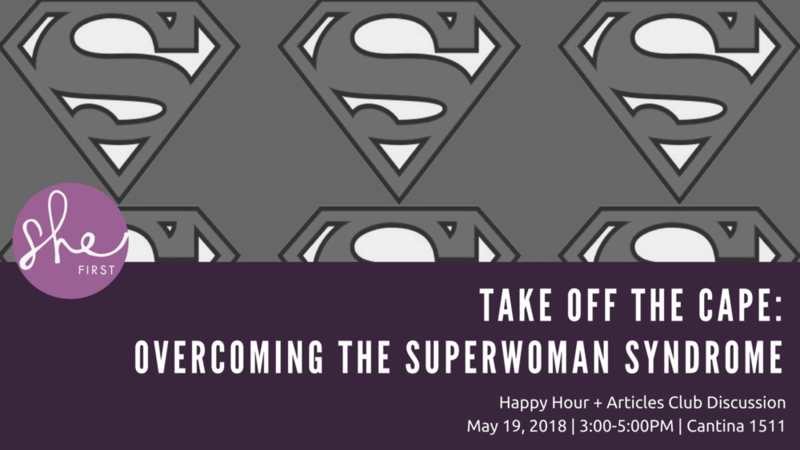 This quarter's roundtable discussion will include a discussion of what is the superwoman syndrome and how to detect if it is impacting you, issues impacting women of color (such as the concept of the Strong Black Woman) and women of varying socioeconomic status, and practical ways to "take off the cape." We are excited to have Dr. Erica James, Assistant Professor of Psychology at Francis Marion University, join us as a guest facilitator for this discussion. In 2015, Dr. James conducted a study to investigate whether the Superwoman Schema has a potential impact on the psychological health status of African American women and will discuss her findings during this event. Elle Magazine article Do You Have Superwoman Syndrome?